Instead, try to make non-confrontational requests, instead of demands. 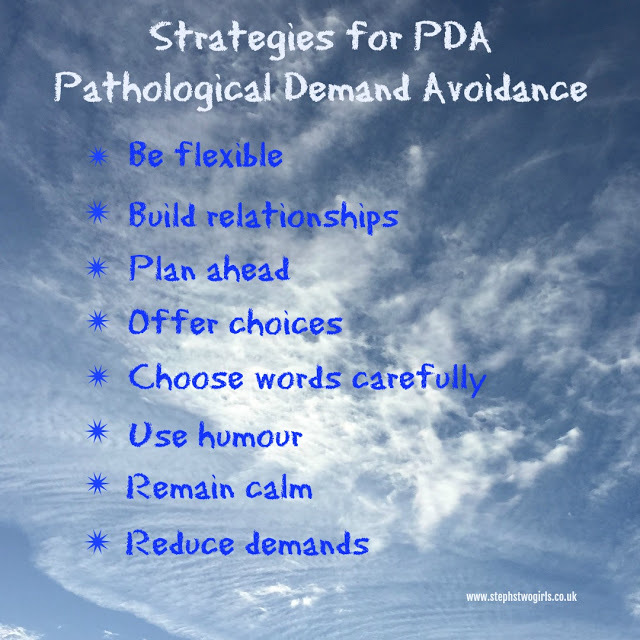 Demonstrate empathy - overall, and as a primary means of de-escalating behaviour. Always demonstrate empathy towards the child first, before taking any other action such as trying to explain your point of view to the child. Most parents are too quick to explain a situation to the child, to provide guidance or teach a lesson. But a child in a meltdown state will not calm down until he or she feels like they have been heard and understood. Empathy is critical not only to de-escalate a crisis, but for your child's overall mental well being - They need to be validated. If you are unsure how to show empathy, techniques include mirroring the child, asking what happened, listen and then validate by repeating back their words ("wow, I can see why that was so upsetting to you, John took your FAVOURITE pen! That would make me mad too"). SO, demonstrating empathy first, before trying to express your point of view, even if you don't agree with your child, is a proven and effective strategy to make your child feel validated and understood, and will help calm them down in order for you to provide a teachable moment. You can be flexible and calm, but none of that matters unless the child feels understood or "heard". By the way, this technique works even on NT adults too!!! The minute you empathise, the other (upset) person will begin to calm right down. Of course, sometimes that empathy is not easy to demonstrate - sometimes you as a parent are frustrated. It can take a lot of effort, but it is worth it! 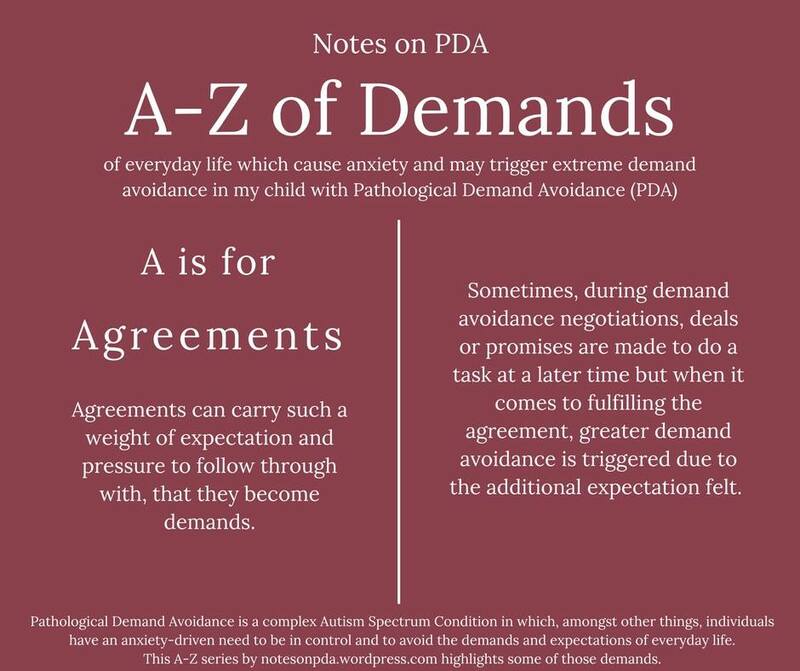 Rule 2 : Build relationships - Trust is critical with any child, but many kids with PDA consider themselves to be adults and equals to their parents, so building trust is even more critical, and difficult. Rule 7 : Reduce demands - as many as you can... some are for safety, but even those must be dressed up as something fun, a helpful 'game', etc..
Rule 8 : Plan ahead where possible - avoid sudden changes to plan and unexpected diversions from a steady existence..
Rule 9 : Pick your battles - some things matter, and some don't, so be prepared to let the big stuff 'go' unless it is dangerous, and don't sweat the small stuff. Rule 17 : Use Post-it notes, or whatever works for you, to remind yourself of what to do, and not do. 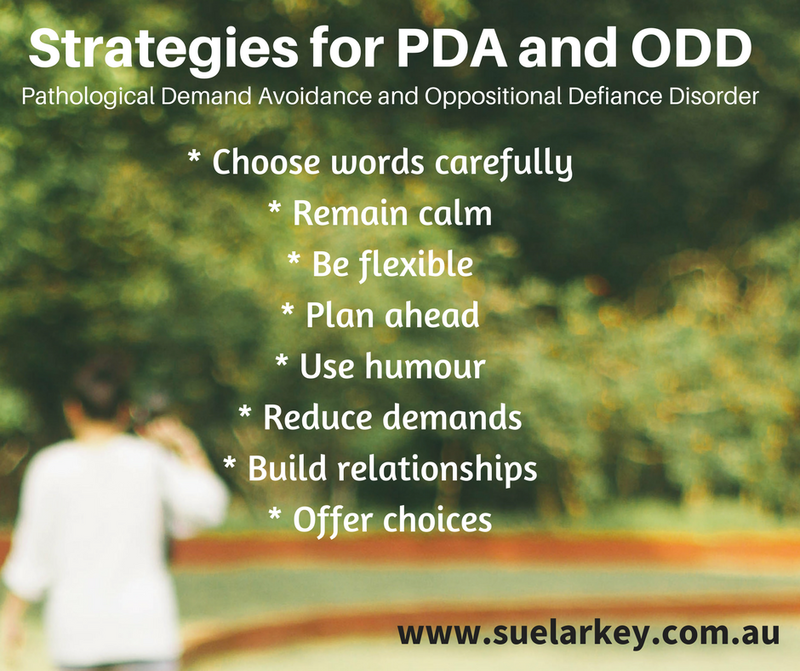 It is often the case that some of the strategies that are typically found to be effective for people with autism (such as the use of routine, predictability and structure) need considerable adaptation. 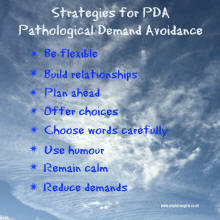 Individuals with PDA respond better to less direct and more negotiative approaches, which may include the following. Choosing priorities ; which demands are necessary and which can be avoided for now? Reduction of demands where possible. eg certain requests and expectations. Being very flexible and creative. 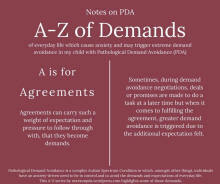 Giving choice and using negotiation. Using indirect language, humour and games to obscure demands. Use of indirect praise and affirmation. One thing is that with any boundaries and rules you give is PDA kids always have to have meaning, especially as they get older. If your child can see the reasoning it's easier to make it happen, as long as you are very casual about it. And always expect the unexpected as kids can always surprises us.